Great bike light but can be used as a flashlight. 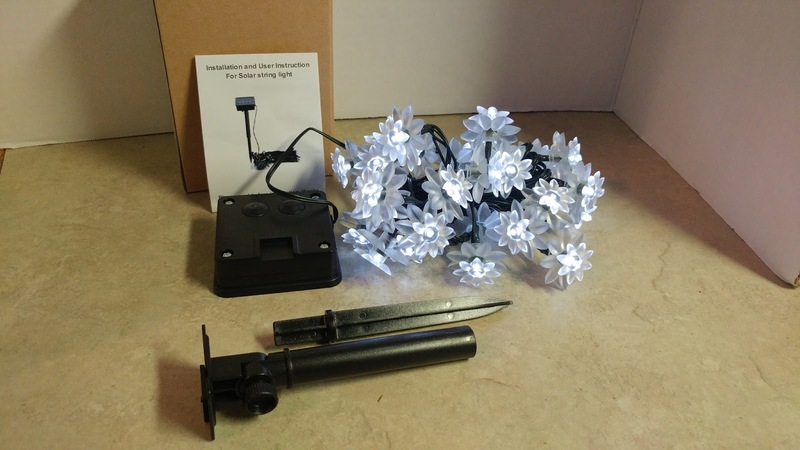 It comes with all the accessories you need, Flashlight, handlebar connector, 1- 185650 rechargeable battery, power cord, and flashing red back light. The flashlight has 5 light settings high, med, and low, SOS, and strobe. Light area does get hot, handle with care. There is a warning on the top of the light to help you remember not to touch the lamp itself, but I would be careful if using around small children. The light itself has a strong and durable military grade Aluminum Alloy body, and it is super light weight at just about 1/4 of a pound. The flashlight is waterproof so great to take along camping or fishing or if you get stuck in the rain while riding. The handlebar connector is made like a releasable zip tie so will fit all sizes of handlebars and can even be put onto a tackle box handle, backpack or whatever else you carry with you. It takes just seconds to install and no tools are needed. The flashlight itself just slides onto the connector and can be removed without having to remove the whole connector. The small blinking backup light comes on a rubber loop connector and can be added to a belt loop or other item so you can be seen at night. The batteries come installed for this as well but you do need to open the battery compartment and remove the small paper/plastic in order for the batteries to make contact and work. 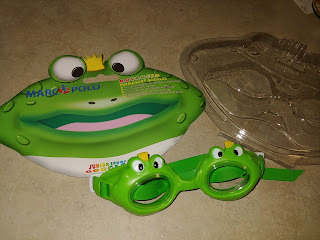 These kids swim goggles by Marco Polo are the cutest swim goggles I have seen. These are the frogs, they are a very bright green each goggle is shaped like a frog. The eye whole is the frog mouth. There s also a gold crown on top of the frogs heads. These glasses have a very stretchy and adjustable head strap. They are made out of a very soft rubber like material on the front and are said to be specially designed to be 100% leak resistant and keep your child’s eyes dry at all times. They are very strong and durable so will not fall apart 5 minutes after being in the pool, ocean, or lake. I love the unique design of these. They have the green frogs, pink crabs, and blue fish in their Amazon store to choose from. My grand daughter is 6 and my Grand son is 4 and they fit both of them very well. These also come in a plastic case like packaging. You do not have to cut the package just pull it apart and it will also close back up. It is great for storing the goggles when not in use. This Outdoor Garden Resin Decor Bird Statue with Solar Light by Hannah’s Cottage is just adorable. I love it. It is filled with wonderful detail. It is made of resin and is 6.1 inches by 4.5 inches by 3.5 inches. It is solar. The ornament needs to be set where it can get 6 to 8 hours of sunlight a day. The solar panel is on the lower back. The light with a full charge will stay on anywhere from 6 to 10 hours. There is a power button on the bottom you must turn on before using the first time. It is a push button. The detail is wonderful. There are even little nail details holding the welcome sign to the post. i love brightly colored the whole thing is. It looks great during the day and the light is very helpful at night. This ornament would look great on a patio, a walk way, in a flower bed, or anywhere outside. With the Welcome on it to me it give a friendly atmosphere. This would make a super cute gift idea. You could give it as is or use it for a center piece of a outdoor or garden themed gift basket. I received the e-HOME 50ft Garden Hose with Spray Nozzle. It’s made of TPE material which is Eco-friendly, corrosion-resistance, anti-ageing and lightweight. The adapter is suitable for faucet with diameter 0.5 in - 0.74 in it comes with 1 50FT Garden Hose, 1 ABS Plastic Grip, 1 3/4” Brass Connector, 1 Garden Hose Adapter, 2 Quick Connectors, and 3 Rubber Gaskets. It is super easy to put together. You install the brass connector to the spigot simply by twisting it on. Then you put the snap in the quick connector which does take quite a bit of pressure and you want to make sure you hear the click. Then if you want to install the spray nozzle you simply just push it in and connect it. You can put the whole thing together in probably less than 3 minutes. My husband enjoys it’s because it takes up much less space than the traditional round water hoses. I enjoy it’s a yellow hose because if I forget to put it up I don’t have to worry about accidentally running it over. Much like all water hoses make sure to drain the hose before putting it up and try not to leave it in the sun, you do want to put it up between uses. This is a really nice tractor riding lawn mower cover. It is made of high quality Sturdy Oxford Fabric with pvc coating offers 100% waterproof protection. The seems are not waterproof but you can put some waterproof tape over them and be good to go. It is made with ventilation flaps to help keep moisture out. There are 2 extra tie down straps it help keep the cover down during winds up to 25 to 30 mph. The bottom of the cover has elastic all the way around to keep your lawnmower fully covered. This cover is great if your lawn mower or tractor is stored outside. The cover is 72 inches Long by 44 inches wide by 46 inches high. The cover will fit decks up to 54 inches. These covers are sold in Green which I have and also grey. The cover is made for but not specific to John Deere, Craftsman, Snapper, Craftsman, Poulan, Kubota lawn tractor, Troy-Bilt, and Husqvarna models, but also considered universal. The cover also features a Life time Warranty. This is a heavy duty cover. It is kind of heavy to pick up folded, but is easy to place on the lawnmower. In Florida there is no point in putting the lawn mower in the shed. We use ours weekly, with all the rain we get in the summer the grass grows very quickly. My husband doesn't like leaving the lawn mower set out but also complains about getting it in and out of the garden shed. This is perfect for our lawn tractor which is a LT5Lawn Tractor with a 42 inch deck. This super bright flashlight by Kllarmant is a T6 LED. It has a metal casing on the outside. There are 5 modes of lighting High, Medium, Low, Strobe, and SOS Signal. It is zoomable and you can also focus. Press slightly on the power button to go through the lighting modes push hard to turn off or on. The neck of the flashlight where the light is is where you push or pull to zoom and focus. The Rhombus is skid-proof and waterproof. This Flashlight is perfect for hiking, camping, hunting, fishing, working on a car, and light enough to keep in a purse, backpack. Fits nicely in the dash of my car and in a desk drawer. This is a great flashlight for more then just outdoors, its great for home, car, and work as well. There is a wrist strap to make carrying it easy. Even though it is light weight you can still use it to break a window during a emergency situation. Can be powered with 1x 18650 3.6v/3.7v OR 3X AAA battery no batteries are included. Comes with the AAA adapter tube. The Superb Bright LED beam and Long Service Time is almost to 50,000 hours, focuses range of 150m to 350m. This is a pretty nice camping table. It is very portable and light weight. It weights just 11 pounds. It takes just a few minutes to have it set up and usable. The legs and braces are 1 piece, there are 2 - 2 piece bars that go on top of the table to lay the table top onto, the table top is all one piece, then there is a mesh storage pin to attache underneath the table.It also comes with a really nice canvas carrying case with a shoulder strap for easy carrying. The table is large enough to set 4 to 6 chairs around. The whole thing is made out of aluminum except the storage bin. The slats on the table are movable. This is rally the only part of the table I am not crazy about. Being movable is fine for some things but I can see the kids knocking over quite a few drinks when the slats move. This table can be used indoors or out. It is great for camping, fishing, and outdoor barbecues. The table is rustproof and fire proof. You can even set a camping stove on it and cook. You can push all the slats to one end and in the opening set a cutting board or something close. My husband decided to give me a hand on this review. He was cutting the grape vines off the back fence. We have a wood privacy fence and the vines are growing up and over and through the fence wood. He made it his project this weekend to get them off of the fence befor ethe weight of them could damage the fence. I handed him this pair of Flora Guard Pruning shears to see how well they would work on the vines. Some of the vines are very skinny others go up to about the size of my finger. He said these pruning shears are Very sharp and takes very little effort to cut vines and limbs. The cut very easy and fit into his hand very nicely. He is quite happy with how well these pruning shears work. These pruning shears have a safety lock that can be locked and unlocked with just one hand. The blades are made of steel, and very sharp. These pruning shears also have anti rust protection, and non sticking layer design. These pruners can cut up to 20mm or 3/4-inch diameter size tree branches, great for most of your yard projects. The handles are plastic and the whole set is lightweight. It's Summer time and were headed to the beach here in Florida. This set of Meigo beach toys are great to take along for the kids to play with. There are 18 pieces of plastic sand toys in the set and a fold out mesh bag. This set is great for the beach, the park, backyard, and any place else the kids can find some sand or dirt. The 18 Pieces in the Beach Toy Set include 6 different Castle Molds, 6 Cute sea animal Molds, 2 Shovels, 1 Bucket, 1 Rake, 1 Watering Can, 1 Sand Sifter, and 1 Mesh Bag. The mesh bag is awesome. It fold up and fits into the bag pocket and snaps shut for easy compact storage. When unfolded it is large enough to store all of the sand toys as well as swim suits, towels, sunscreen and more. You can also toss the bag in the washer after a day at the beach. The set is made out of BPA Free Materials. They are made of soft but sturdy PP plastic. They almost feel like they have a rubbery coating on them to make holding onto the pieces easier. The pieces are brightly colored so even the younger kids will enjoy looking at and playing with them. Really nice set of binoculars. They are lightweight. Weighs just 0.33 lbs. Comes with a cord for hanging around your neck. They are waterproof and fog proof so can be used any weather conditions. Comes with a velvet drawstring bag and a lens cleaning kit. Great for kids and adults. Adjusts easily to get the perfect view of small and large things. The are 10 times magnification and 22 mm objective lens No color difference High-definition HD resolution lens, and have a wide field of view, 131m/1000m. Great for viewing things pretty far away or small. Work very well for concerts, the theater, the opera, viewing Landscapes, while hiking, camping, at sport events, bird watching, and more. They have a durable anti-slip grip, feels almost like the silicone rubber. These are very easy to adjust. They fold in and out to adjust to each person face, and can screw place to hold the size. You can adjust the lens to get a clearer view of a single object you are looking at, but you can also adjust for a scenic view as well. These would make a great gift for someone who loves the outdoors, for boy scouts and girl scouts, people who like the theater. For that curious child or adult even. 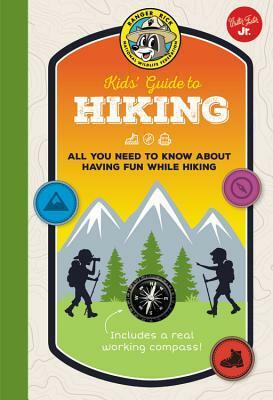 Ranger Rick Kids' Guide to Hiking by Helen Olsson is a have to have book if you are going hiking. The book is written for kids 8+ but if you have never been hiking it would be good for adults as well. The book tells you where to go , when to go, what to take with you and more. There are lots of illustrations throughout the book to make the book even more enjoyable. And of Course Ranger Rick is on almost every page. He is an adorable raccoon. The book is written in easy to understand language, and filled with tips, ideas, and even some hiking rules. 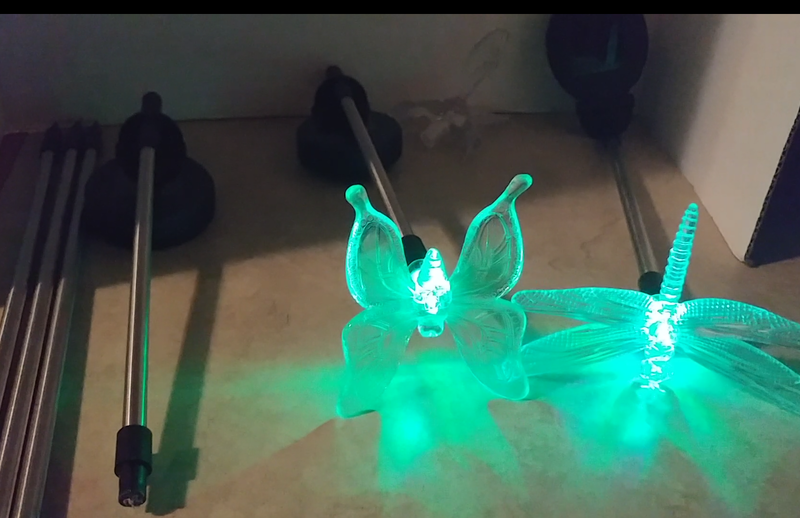 These are super cute solar Garden stake lights. The lights rotate through several colors. There are 3 stakes in the set a butterfly, a hummingbird, and a dragonfly. The stakes are metal and 2 piece. The lower piece is about 16 inches long and the upper piece is about 12 inches long. They simply slide together. The Solar part is attached to the top piece. You also just slide the butterfly, hummingbird, and dragonfly onto the top of the stake. There is a sliding power switch on the bottom of the solar panel to turn the lights on. These lights need 6 to 8 hours of sunlight. When they get enough light they will stay lit 8 to 10 hours. They come on automatically at dusk and go off automatically at dawn. I love solar lights because I am really bad about remembering to turn my outside lights on and off. With solar lighting I don't have to remember to turn then on, and I don't have to fight with cords or using and wasting electricity when I forget to turn them off during the day. These Garden stakes will look great in any garden, bare spot in a yard or as path stakes. I love these beautiful Lotus Flower lights. I am also a huge fan of anything solar powered. So with these I get solar power and beauty in one strand. These are also LED so they should last a really long time. I am terrible about remembering to turn outdoor light strands on or off. So I either have a dark flower garden or the lights waste energy being on during the day. With these lights I get the beauty at night and never use any electricity. These will charge themselves even on cloudy days and at night they are very bright. I also love these there are 2 modes to choose from solid and flashing. The strand is 19.7 feet long and there are 30 lights on the strand. I can go around my flower bed or even use these on a porch. My husband has put a slit a in the screen of my porch to be able to attach the solar box outside of the porch in full sunlight. But I have also just set these on the ledge around my porch and they have charged, where the sun shines in several hours of the day. The floral bulbs are beautiful where ever you put them and could even be used as part of any holiday light display. I can see us getting a lot of use with this light. My husband is always working on something in his shop and needs lots of bright light. We live in Florida and during the summer we have a lot of storms and living in the middle of a National Forest the power does go out quite bit. And we love doing things outdoors. This is a Super bright light. Great for camping, working on the car, power outages and anything you need a light for. This light is very lightweight, so great for taking in a backpack camping or Storing in the car. It is also compact so will not take up a lot of room no matter where you store it. This has 2 ways to temporarily mount the light. The metal adjustable handles on either side, there are 3 strong magnets on the bottom. The light runs on 3 AA batteries which are not included. But any AA batteries should work fine. I tried it with alkaline and rechargeable batteries and it worked fine. The light works very easily and will not run down batteries by accidentally being turned on. You just simply hold onto the bottom and pull the top upwards to turn the light on and slide it back down to turn it off. The lighting can be adjustable by not opening it all the way. I received this product during a promotion free for my honest review and they are 100% my own opinions. I received no compensation for this review and I am not required to give a good review. I am also not associated with the seller in any way. Awesome 10 piece barbecue tool set. Comes with everything you need all in a very nice aluminum case. In the set you get a spatula,m a pair of tongs, a grill brush, A meat fork, a silicone marinade brush, a knife, and 4 skewers. All of the pieces have the extra long grill handles on them so you can cook without getting your hands burnt. Every piece is made out of stainless steel. There are hoops on the end of each piece so you can hang them if your grill has the hooks on it. The tools are dishwasher safe, so you can give them a quick rinse off at the grill and wash them well at home. The case is made out of silver aluminum. It has a nice handle for easy carrying. There are 2 latch locks to keep the case closed when not in use. The inside of the case features velcro strips to hold the tools in place. There is a canvas like covering on the inside of the case which you can wipe down with a damp cloth. This is a really nice set for backyard barbecuing or on the go. Great for taking the beach, park, lake, or anywhere else. The set is lightweight so great to take camping. This would make a great gift for anyone who enjoys grilling. Super lightweight 2 person pop up tent. This is a large roomy tent it is 3 ½ foot high and a 9 1/2 feet long and 6 1/2 feet wide in floor area, it will hold 2 to 3 people. Comes with the tent and tent stakes. Everything folds up into a nice zippered tote bag. Has 2 doors one in the front and one in the back each door features a screened panel and a solid panel. It also has 2 side screened windows with a solid panel covering that also zippers shut. The shell is a waterproof nylon. The poles are made of fiber glass. The zippers are made of nylon as well so they will not rust and they are also waterproof. There is also a pocket that is below the window, where you can store things you may need during the night like a flashlight, snack, radio, camera, wallet, or other small items. The tent itself takes seconds to put up. Take it out of the bag, pull the elastic strap out from around the tent, kind of wiggle it and it pops up all on it's own. The tent stakes fit into the elastic loops attached to the ends of the tent. Once you know how to fold it up its simple and quick, I youtubed it myself after fighting with it for a while. This really is a great tent. When it is folded and in the storage bag it is easy to put away for storage. The circular bag itself with the tent inside is 29 inches across and about 4 inches deep. Stores nicely in the back of truck or even in a trunk. This will be great for anyone who loves camping. My Grandson is in his first year of Cub Scouts and going on his first ever camping trip. He is also a true fan of nature. 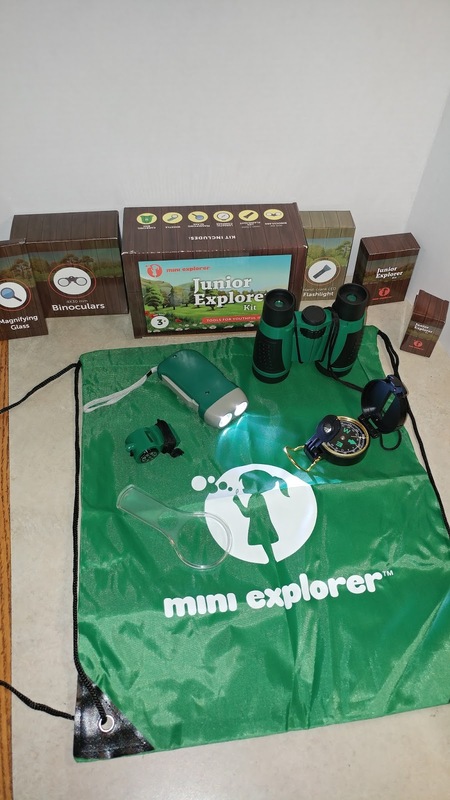 I saw this Nature's Explorer kit and knew he would have to have it. His birthday is next week and his camping trip is in a couple of weeks. I am going to give this to him for his birthday. I am positive he is going to love it. 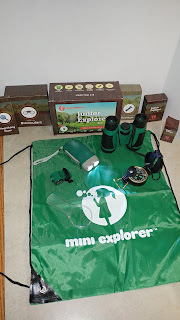 Mini Explorer has done an awesome job coming up with this great kit. Everything he will need to enjoy his camping trip is included. 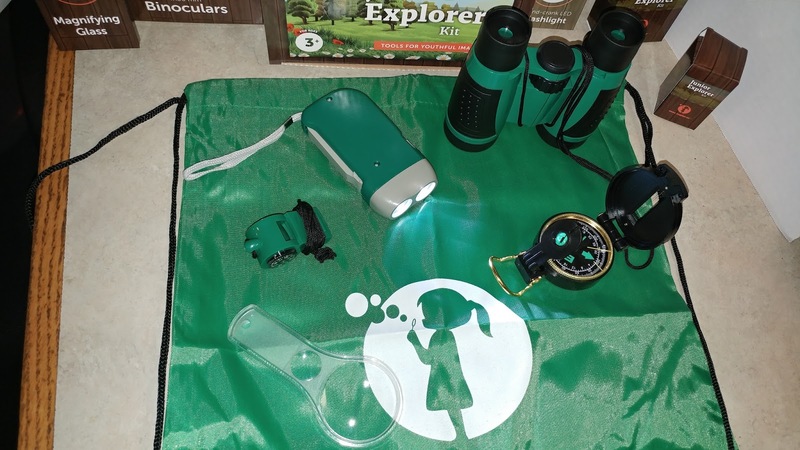 There is a set of binoculars, a compass, a whistle which also has a small compass on the side, a hand crank flashlight, and a backpack style bag. I am loving the flashlight the most I think. There are no batteries needed, just pull the crank out on the side and turn it and it charges the light. The flashlight is actually quite bright. There are 2 bulbs in the flashlight. This will be awesome if he needs to go to the bathroom in the night, or if he just gets scared. And not having to carry extra batteries or worrying about the batteries dying is a huge plus. The pieces are all made of plastic but they seem very sturdy. 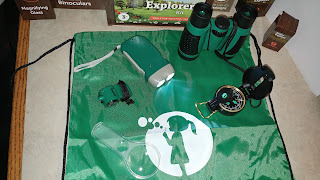 The bag is also awesome, it is made of the parachute type material, it will hold all of the pieces to this set as well as any treasures he finds on nature walks. I am so excited to give this to him. I know he and any other young child, boy or girl, with an interest in nature would love this as well. Nice solar light in a quart glass jar. There is an off and on switch, and a easy hanger. This jar light looks great setting on a table or hung up. It is a clear glass jar. It can be filled with decorations or left empty. You can add seasonal decorations in the jar or just things you like to go with your decor, like shells, flowers, or whatever. When the season or your decor changes just open the jar remove the items and start all over. When replacing the Solar panel on the jar, there is a white circle. This circle needs to be placed where the flip switch for the power is located or the light will not come on. The light is great for outdoors, on a porch, or even inside as long as it is placed where it can get at least 6 to 8 hours of sunlight a day to charge it. The light uses 2 AAA solar rechargeable batteries, which are included and installed. There are 4 LED lights on the bottom part of the solar panel. The easy flipping power switch gives you light when you want it or you can turn it off and reserve the batteries charge. The lights are bright enough to add light to a small room. If setting next to it, it is actually bright enough to read by. I love my light. These lights would also make a nice gift. We are a very patriotic family. My husband is a Army Veteran and my Son In Law is a Marine Veteran. We fly the colors proudly. Having flags is a big deal around my house. Having quality flags are a must. Our flags fly year round. We live in Florida and with the harsh sunlight, heat, and humidity flimsy flags do not last long before they dry rot and start to fall apart very quickly. 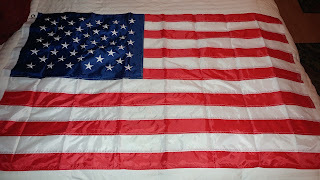 This flag is made out of nylon, it is like a parachute type material but a bit thicker. The pieces and parts are all sewn together with thick double seams. The stars on the flag are embroidered on, they are not appliques. The strips are sewn together, they are not dyed red and white striped solid material. The colors are vibrant and bright. This flag really stands out. 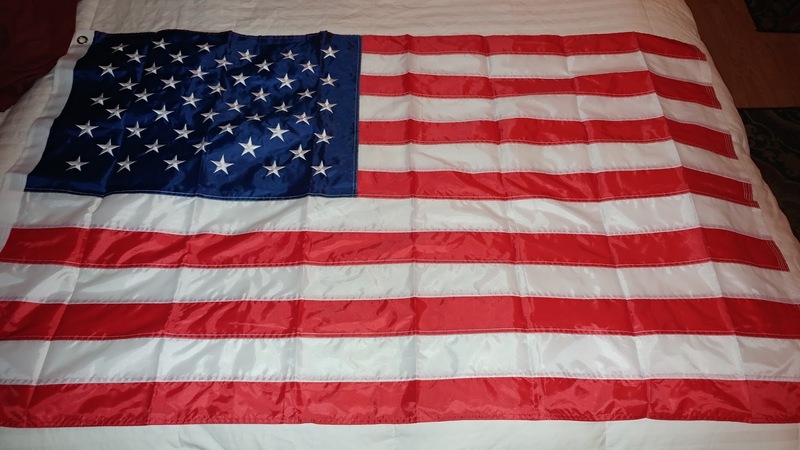 I really like that this flag is made out of a quick dry material. With the frequent summer rain storms that dumps a lot of water in a very short time then goes right back to burning sun and heat quick dry is important to keep the flag from molding. 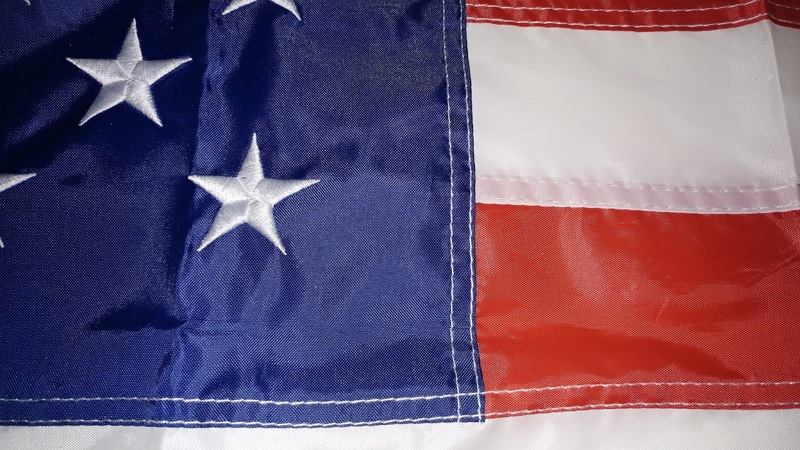 The grommets at the top and bottom of the flag are sturdy brass. They grommets are attached very well. I can see this flag flying proudly for a very long time. And being 3 by 5 foot it will be easily seen. 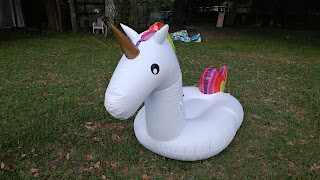 I was totally shocked at just how huge this Unicorn is. I knew it was going to be a lot larger then any other pool toy I have had but WOW!! 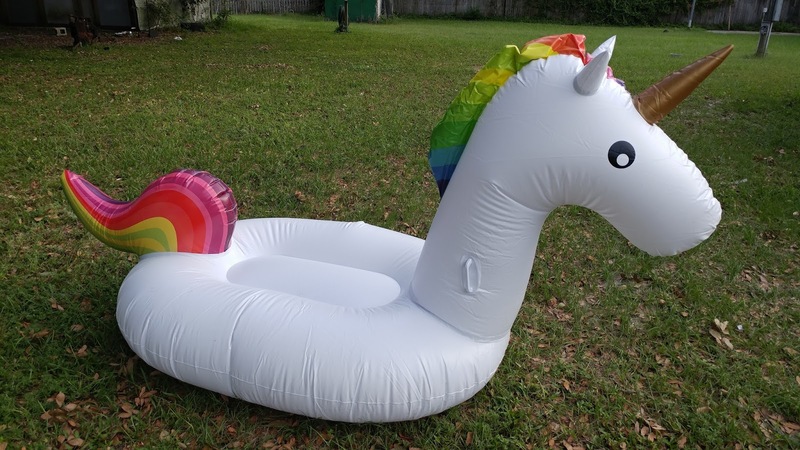 I actually blew this up in my bedroom with the air mattress air compressor. Then I liked to have not gotten it out of the room and out the door or off the porch. This is 108.2 inches by 55 inches by 47 inches. Which is about 9 feet long by 4 1/2 feet by almost 4 feet. 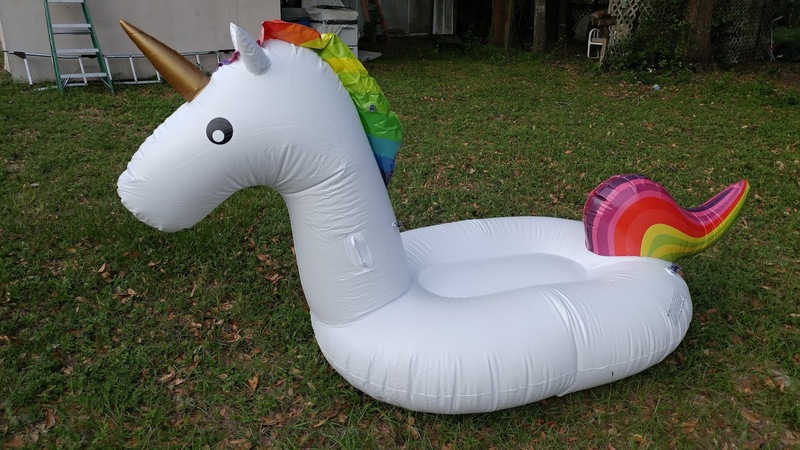 This is not for a kiddie pool, it's for a large pool. The float will hold up to 400 pounds or 2 adults. The float is made out of a soft rubber. It feels like laying on a air mattress. There are 3 air spots. One in the seat area, one in the head/neck area, and one in the mane area. Like I said I used the air compressor from my air mattress to blow this up. There is no way I could of blown this up like a balloon. You will need some type of air compressor. I love the rainbow colored mane and tail. It really livens up this float with color. The float also comes with a backpack. 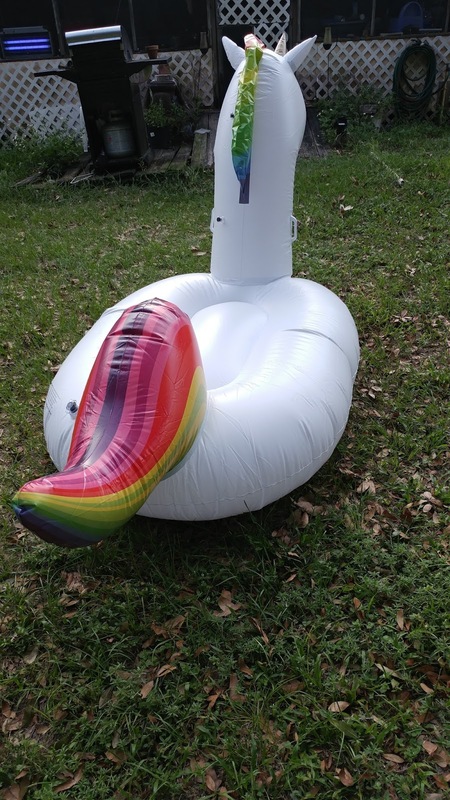 Great if you are going to a pool party or even to the beach or lake, and also for storing the float when not in use. This an awesome float and I love it. Very comfortable to lay on while floating in the pool.